BMW announced this week that the redesigned 2014 X5 SUV will start at $53,725, including destination, which represents an increase of $5,300 over the 2013 model. 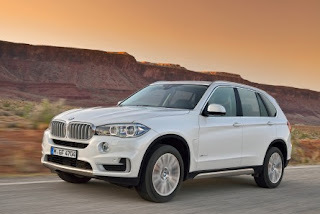 For 2014, BMW adds a new base model, the sDrive35i, which is the first rear-wheel drive X5 BMW has offered. Other models, all of which have all-wheel drive, include the xDrive35i, which starts at $56,025, xDrive35d (diesel), which starts at $57,525, and xDrive50i, which starts at $69,125. According to USA Today, “BMW says straight price comparisons aren't fair,” given the 2014 model’s increased size, lower curb weight and added standard equipment over the 2013 model. When looking at the prices of rivals in its class, the new X5 is still more expensive. The Mercedes-Benz M-Class starts at $48,175, the Acura MDX starts at $43,185 and the Porsche Cayenne starts at $50,575, all including destination. For 2014, the 35i models are powered by BMW’s turbocharged 3.0-liter inline six-cylinder engine, rated at 300 horsepower and 300 pound-feet of torque. This engine carries over unchanged from 2013. The 35d features a 3.0-liter six-cylinder turbo diesel engine that makes 255 horsepower and 413 pound-feet of torque, which is a loss of 10 horsepower and 12 pound-feet of torque over the 2013 model. The 50i has a 4.4-liter V8 rated at 445 horsepower and 480 pound-feet of torque, which is an increase of 45 horsepower and 30 pound-feet of torque over the 2013 model’s V8 option. All X5 models have an eight-speed automatic transmission. The EPA has yet to publish fuel economy information for the 2014 X5, but for reference, the 2013 xDrive35i is rated at 16/23 mpg city/highway, the diesel xDrive35d at 19/26 mpg and the xDrive50i at 14/20 mpg. BMW says the 2014 X5 comes with more standard equipment, including an engine start-stop feature, iDrive navigation with a touchpad and a 10.2-inch display and a 40/20/40 split-folding second-row seat. A two-passenger third-row seat is optional. BMW offers a few trim lines for each model that add features and equipment to the X5. These trims include the Luxury Line, xLine and M Sport. To Car and Driver, the new X5 appears “a little chunkier” than the 2013 model, but points out that BMW claims to have reduced the new model’s curb weight by about 170 to 230 pounds. The gas-powered 35i and 50i models will hit showrooms in the fourth quarter of this year, while the diesel model will arrive in early 2014.